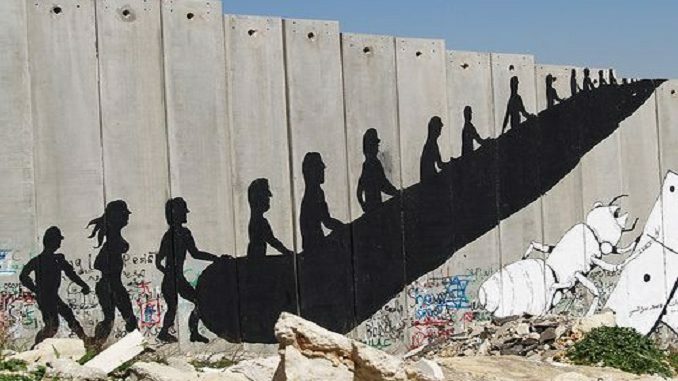 Art on the Israeli Apartheid Wall in the Occupied West Bank. Israel is where South Africa was during tumultuous periods of intense oppression. Its racist right-wing bigots who parade on the international stage as “respected” Jewish leaders are as immoral as the perpetrators of injustice who wore Christian labels in South Africa. Israel is doomed to failure as it pursues draconian measures to survive. The writing is on the wall. Former allies within American Jewry are openly turning their backs, disgusted and ashamed to be associated with horrendous atrocities committed in Gaza in their name. Writers, commentators, and artists have become more pronounced in their denunciation of senseless violence against Palestinians. Cultural boycotts are beginning to bite as more and more international stars take heed of the call to isolate Israel. The only lifeline allowing the Netanyahu regime to retaliate without any moral or legal considerations is the triangle of collaboration between the Trump administration, Saudi Arabia, and the United Arab Emirates. Israel foolishly relies on a flimsy alliance of despots, dictators, and unelected leaders to fulfill aspirations of legitimacy which has evaded it for seven decades. In contrast, the Palestinians have not resigned to accept their fate as losers. Instead, they remain resolute and determined to offer supreme sacrifices as they continue striving for full emancipation. This entry was posted in News and politics and tagged Artificial created Israel, doomed to fail, South African apartheid.. Bookmark the permalink.